The party was like most in those days…. Jim Reeves on the gramophone, cheese and pineapple sticks pushed into grapefruit on the table, lethal punch, bubbling ominously from its depths, and lights on low. The guests soon paired up and serious getting-to-know-you was in order. It was more a time for choosing potential life-partners, than the opportunity to have fun and someone to go out with. At least, that’s the way it felt, back then in those Cold War years. How is this for a tale of romance? HBTW unsquashed (I had been sitting on his knee) and undaunted (I found his accent quaint but difficult to follow: holiday job at paint factory / bean factory?) didn’t know my address but he did know where I lived, having driven me home the evening before. Unbeknown to me he retraced the drive, found the house number and street name and sent a letter to me addressed to Miss F…..? Who could resist such tenacity? 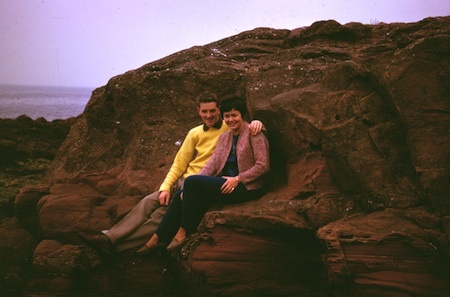 A year and a bit later we were engaged to be married – 47 years ago today. And didn’t we look young?